DECEMBER 16th, 2008 – Movmnt Creates, and Believes. 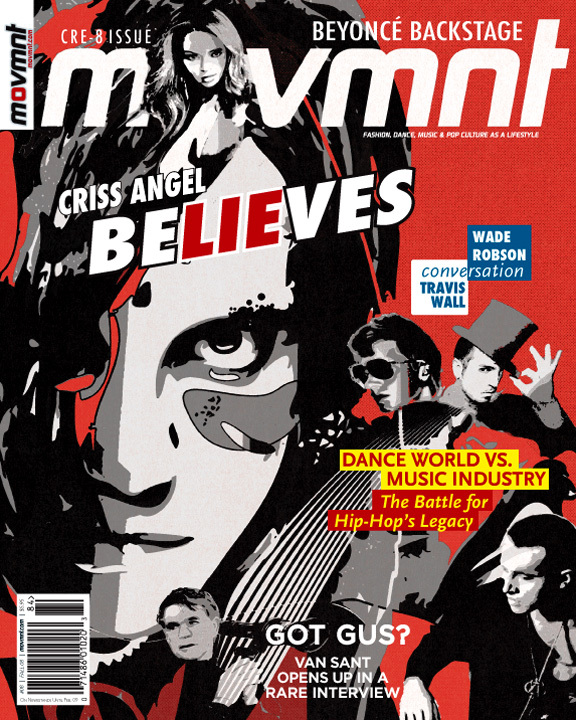 With illusionist Criss Angel featured on the cover of their Fall 2008 issue along with performer Beyoncé Knowles, movie director Gus Van Sant, contemporary choreographers Wade Robson and Travis Wall, and Tony Testa, leader of the new generation of Hip Hop Dancers and move makers, the quarterly Dance and pop culture publication … Six believers among over 20 featured creators that make a difference in the art world. Do you Believe in Magic? Criss Angel does. In Movmnt’s cover feature, the renowned illusionist gives insight on creation as a process, a product and an innate part of his vision and passion for Believe, a new show in collaboration with Cirque du Soleil. From one great creative mind to another: a conversation between So You Think You Can Dance performer and choreographer, Travis Wall, and Emmy Award winning choreographer Wade Robson about the inspiration to create movement. 19‘70s: it began on the coasts; ‘90s: it took a back seat to gangsta rap; now: hip-hop dance is back. Through popular television shows like America’s Best Dance Crew and feature films such as Step Up and Stomp the Yard, the hip-hop dance revolution has re-energized the dance world. Movmnt takes you to the heart of the battle with a stunning fashion editorial captured by fine art photographer Koury Angelo. Featuring performers and choreographers from Monsters of Hip-Hop, Movmnt tells the story of hip-hop dancers in their fight to steal hip-hop back from the music world.Created in 2002, Monsters of Hip Hop uses some of the best choreographers in the business to provide dancers with the education, experience, and performance opportunities to immerse themselves into the world of hip-hop at nationwide conventions. Movmnt talks with young choreographer Tony Testa about his inspiration, contributions, and successes in the world of hip-hop dance. Exclusively for Movmnt, co-choreographer JaQuel Knight takes us around the set of Beyoncé’s new video, “Single Ladies (Put a Ring on It)”, with a backstage pass and never before seen pictures of the Queen B and her pair of Ailey dancers. Along with music reviews of the latest sensation albums, insider fashion portraits, and a look into the life of child Broadway stars, Movmnt contributor Mario Spinetti talks with Atlantic Records artist Marc Broussard about his intentions for his music, his experience with the label, and his collaboration on the new album Keep Coming Back. Before the highly anticipated release of Milk, Movmnt sits down with talented director Gus Van Sant in a rare interview. Following such films as Good Will Hunting and Elephant, Van Sant’s new movie Milk is the story of California’s first openly gay elected official, Harvey Milk, was responsible for the beginning of the gay rights movement. In this Movmnt article, Project Runway producer, Blake Davis, discusses the movie and Harvey Milk’s character, played by Sean Penn, with Van Sant, discovering his creative and effective style as a filmmaker. Broadway Babies – Is there a career in acting after Broadway child stardom? Plato vs. Balanchine – A performer’s dilemma: getting a degree or starting a career?